Being bright yellow and transforming from gas to electric, the car's name unsurprisingly became Bumblebee. As with any project, there is always room for improvement, but right now the car is "complete". I really think electric cars are the future. Their potential for performance is undeniable (see Tesla). They're far simpler than their gasoline counterparts which means less maintenance and outstanding reliability. Electric cars generally don't have transmissions, complex cooling systems, exhaust systems, fuel systems, or oil changes. The future of electric cars has even more potential. Electric motors have a single moving part (rotor), and in the future hub style motors mean cars won't even need an axle or differential! The goal of the conversion was a small / fun convertible with minimal weight. The more I could drive down the overall weight, the greater the range and acceleration with fewer batteries and smaller components. I didn't have hard requirements for range (my work commute was and is incredibly short) so as long as I could get to local stores and back I was happy. 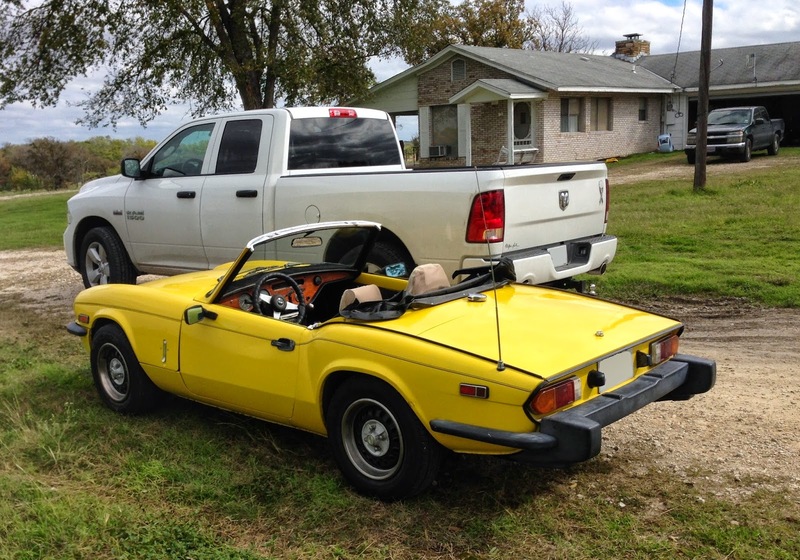 I searched around for small convertibles such as Mazda Miatas, Fiat Spiders, and MG Migets. Something I noticed is starting from the 1980s to present day cars got very heavy very fast. Typical 1980s cars may be in the mid-upper 2000 lbs, 1990s cars in the 3000 lbs, and then the more modern cars were in the upper 3000 lbs! An example of the weight progression: a 1990s Miata is 2070 lbs, an early 2000s Miata is 2348 lbs, and a more modern Miata is 2500 lbs. I took a look at a few cars, but the winner by far was the Trimph Spitfire. The car is VERY light (1900ish lbs). The entire hood tilts up so you have outstanding access to the motor bay. Even replacing the brake master cylinder is just a few easy to reach bolts. The car is very simple - no power steering or power brakes (it doesn't need them). But more importantly that means I don't need to maintain a separate pump system to support those. The Spitfire I bought had been garage kept in Phoenix, Arizona - the only rust worth mentioning was at the battery compartment. The car pseudo-ran, but carburetors that are left alone don't have the best reputation for starting back up, so we towed it to my place (I was living just outside of Phoenix at the time). 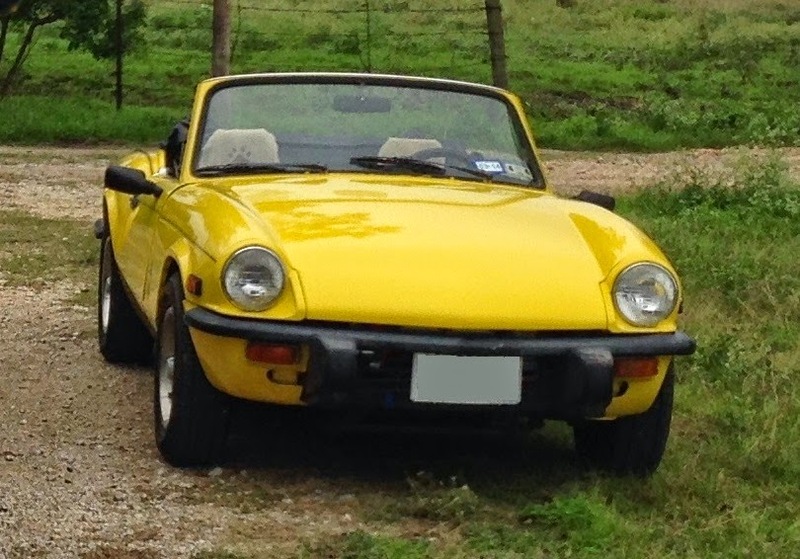 I highly recommend reading this very entertaining "Best of Craigslist Ad" for a Triumph Spitfire: http://www.craigslist.org/about/best/aus/990076336.html An excerpt from the ad trying to convince your wife you should be able to buy it: "you've upped your life insurance to a cool $1 million dollars and this car doesn't have air bags & sits at the height of a big rig's lug nuts." I have had 1 LiFePO4 go bad which I've replaced recently (the single blue cell you see above), but my pack is turning 6 years old so a single bad cell isn't too surprising. Also up until the past few years, DC motor systems were the choice for conversions - relatively cheap and simple. AC motors/controllers are more expensive but they're more efficient and reverse / regenerative braking is trivial for them to do. (Also a DC motor controller can fail in the closed position - meaning run away car. AC motors are safer in that regard.) There were several options and suppliers for buying DC motors and controllers for me at the time, but that wasn't the case for AC systems. Now the selection of AC systems are better. Since my donor was so light (and I was using LiFePO4 batteries), I was able to get away with a smaller 6.7" DC motor and still have great performance. The Control Plate going counterclockwise from top: Contactor (controlled by the key), 500A Motor Controller (to vary the power going to the motor, controlled by foot pedal), Ammeter Shunt (for gauge on dashboard), Circuit Breaker (with safety handle at the driver's seat for emergency shutoff), Fuse, and DC-DC Converter (converts 96V main pack to 12V for car's components). About 20 miles at highway speeds (50 mph). About 30 miles at city speeds (30 mph). Since I removed the clutch (but kept the transmission), I pretty much throw the car in 2nd gear and do all my driving in that. That gives me plenty of acceleration (probably better than stock) and a good driving speed of 35. (At 40 mph I risk over-spinning my DC motor so I try to keep it in mid 30s while in 2nd.) I can clutchless shift into 3rd gear to get in the 50s, but I try to avoid that to limit excess wear/tear on my 1970s transmission. I know the electric motor sounds small, but it provides full torque at 0 rpm; I have to be careful in reverse so as not to chirp the tires! If I could go back in time, I would have tried to keep the clutch. That would have made transitioning to highway speeds easier. In terms of components, I'm pretty happy with all my decisions based on availability at the time. If I were to do it again (or do a major overhaul on my car), I'd switch over to an AC system. Also I'd like to completely remove the transmission - just do a direct drive from the AC motor to my differential. I've been tempted to swap out my current DC controller with a more powerful one (higher maximum current) - then I could do all my driving in 3rd gear. I would only need the transmission to go into reverse, but there are options for me to wire my DC motor to support reverse. The downside to starting in 3rd gear is that to get decent acceleration I have to pull more current - which is less efficient and puts extra strain on my batteries. As I pull above 3C (3 * the capacitance of my batteries, or 3 * 100 = 300 Amps), the voltage starts to sag and I get diminishing returns. I'm already pulling 200-300Amps to get good acceleration when I start off in 2nd. Really though, the car is driving great as is now. My differential seal is leaking a bit so I need to get that replaced, but there are far fewer things that can / do go wrong on this car compared to a comparable gas car! Amazing post. Loved everything about this car. You have explained everything quite nicely. Anyways, I need to buy EC and just found another useful post at Whichelectriccar.com.au. They have shared an easy to understand Electric car buyers guide as well.